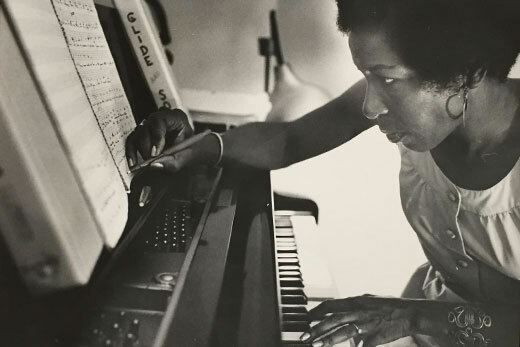 An undated photo of Mari Evans at the piano. From the Mari Evans papers, Rose Library at Emory University. Wednesday, Feb. 21, at 6:30 p.m.
Emory University will celebrate the contributions of Mari Evans, an influential Black Arts Movement writer and activist, with poetry readings and a panel on Wednesday, Feb. 21, in the Jones Room at the Robert W. Woodruff Library on the Emory campus. “The Rebel: In Celebration of Mari Evans” will begin with a reception and readings of her poems by students at 6:30 p.m. From 7-8:30 p.m., Black Arts Movement scholars will participate in a panel on the multi-faceted aspects of Evans’ practice as a poet, educator, musician, activist and author, followed by a question-and-answer session. The event is open to the public at no charge, but attendees are asked to sign up at the registration link. Evans was also the author of the plays “Eyes” (a 1979 musical adaptation of Zora Neale Hurston’s “Their Eyes Were Watching God”) and “River of My Song” and taught at colleges and universities including Spelman College, Purdue University and Cornell University. She died on March 10, 2017, at the age of 97. Emory’s Stuart A. Rose Manuscript, Archives, and Rare Book Library holds a large collection of Evans’ papers. This event is co-sponsored by the Rose Library, James Weldon Johnson Institute for the Study of Race and Difference at Emory University, Emory’s English department, the Creative Writing Program and Fearless Dialogues.